Shahid Afridi usually stays in the lime light. Lately a controversy has surfaced between Shahid Afridi and Pakistani cricket, Javed Miandad. 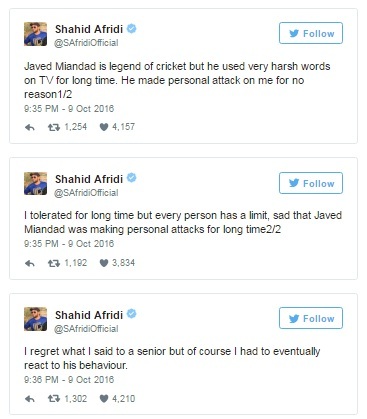 The series of argument started when Javed Miandad made a comment regarding Afridi’s desire for a farewell match. Miandad said “Afridi is always after money’. While answering Miandad’s comment Afridi said, “Money has always been an issue with Miandad. That is the difference between him and Imran Khan”. In reaction to that Afridi said, “Honestly, I am not desperate to get my farewell match. The love I have gotten from fans over the years are the biggest earnings in my entire career”.